The 23-year-old Cork runner will compete in tomorrow’s European Championships 100m semi-final after finishing second in her heat. Phil Healy at the Olympic Stadium in Berlin. PHIL HEALY CONTINUED an incredibly impressive season by qualifying for the 100m semi-finals at the European Championships in Berlin on Monday afternoon, while Gina Akpe-Moses came up just short by 0.02 seconds. Healy will compete in tomorrow’s semi-finals at the Olympic Stadium after crossing the line in second place with a time of 11.44 running in lane six. The Cork woman broke the 23-second barrier to set new Irish 200 metre record just last month and was delighted with her performance in the German capital. Phil Healy finishes second in her heat and has qualified for the semi-finals of the 100m at the European Championships in Berlin. Gina Akpe-Moses misses out by 0.02secs. “I think it was 11.44 seconds at the finish, which is great in these conditions,” she said afterwards. “It was nice to get a run out today and then come back for the semi tomorrow. “I knew I had my speed and endurance to come through, so it was just about staying relaxed. Even some the races I’ve had during the season in Cork girls have gotten away, so it’s about staying composed and finishing it right through. It’s absolutely super and a confidence boost knowing the shape you’re in. I’ve been to European seniors before in 2014 and I just missed out on the semis. “So to come here and get an automatic cue is just absolutely brilliant and it makes up for 2014,” Healy added. Competing in her first ever senior championships after claiming gold in the European U20s 12 months ago, 19-year-old Akpe-Moses ran an impressive 11.63 seconds — which placed fourth. “I feel good. I think I ran quite well to be honest, so I’m happy,” the Dubliner said speaking afterwards. “I feel like I got on really well, I wasn’t nervous, I was very relaxed and ready to go. My aim was World Juniors so all the stress was gone after that. “I feel like I was in the mix right from the start almost to the finish, so I’m ready for seniors now. I think it’s a good indication of where I need to be, where I’m about to be. I’m going to work hard now and just build and build. I’m just happy that I’m even here to run. “It’s been a great year, I didn’t even plan to be here. So the fact that I’m even here is a bonus, so I’m quite proud of myself. 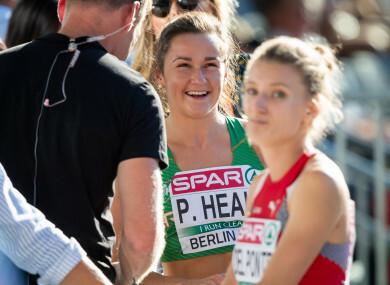 Email “Joy as Ireland's Phil Healy books place in European Athletics 100m semi-finals in Berlin”. Feedback on “Joy as Ireland's Phil Healy books place in European Athletics 100m semi-finals in Berlin”.